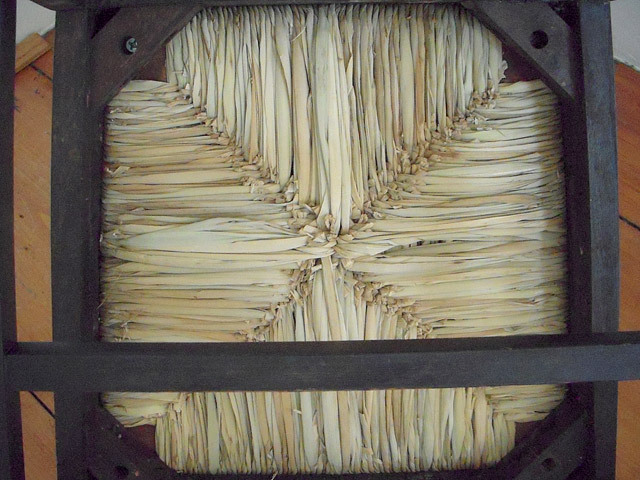 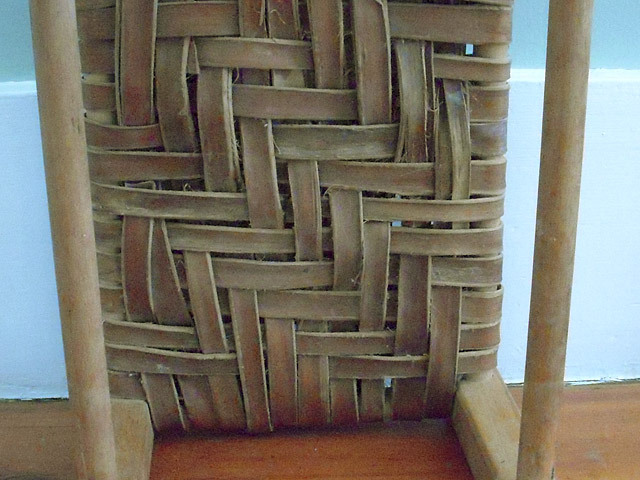 Please click on the thumbnails below to see examples of some of our natural rush, cane, and wicker chair seat repairs. 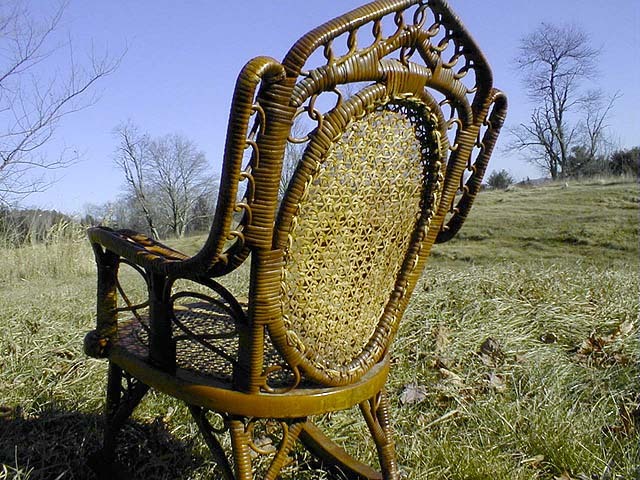 We work on a wide variety of chair styles, with various types of materials. 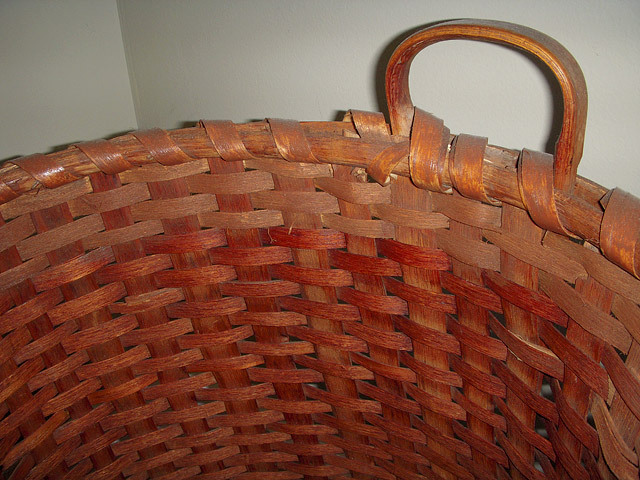 We also work on benches, baskets, step stools - and welcome a challenge. 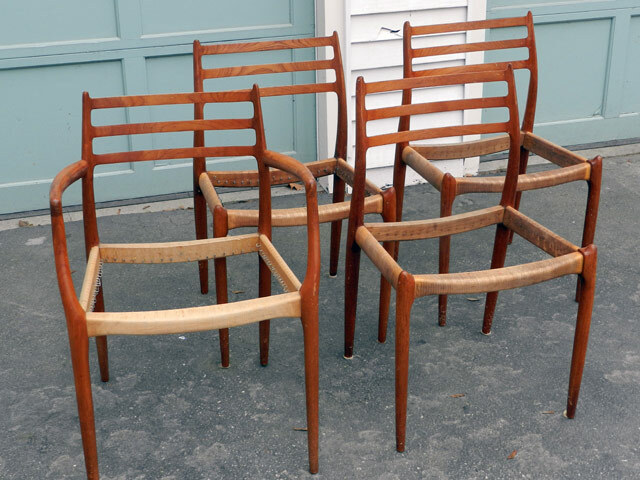 Please contact us with any questions! 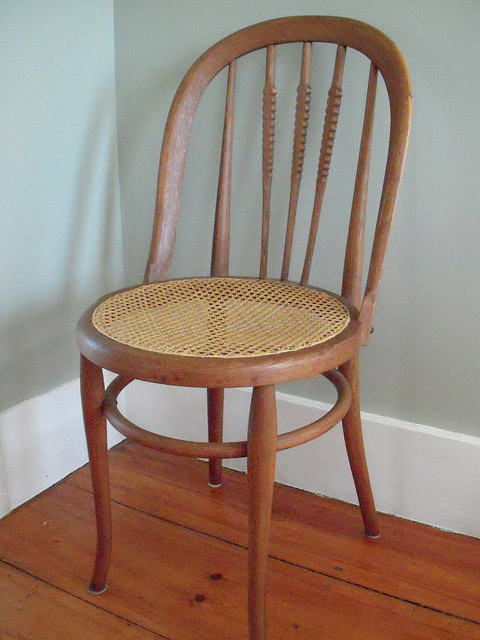 This barrel backed chair was done in the "French" or "blind" cane style - the holes are not drilled through the frame. 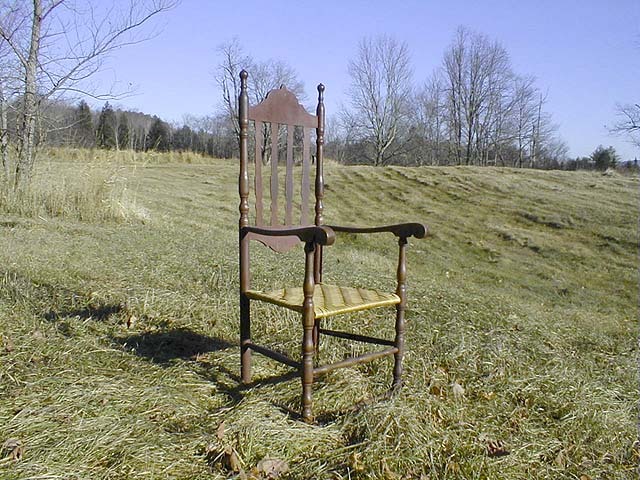 Another view of the barrel backed chair. 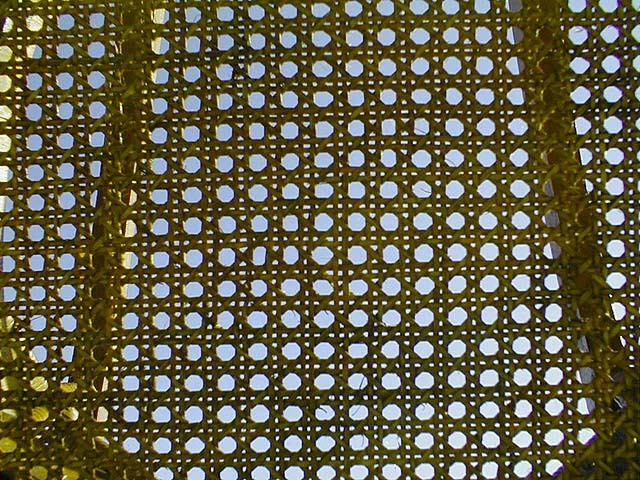 Getting the curve right is especially difficult. 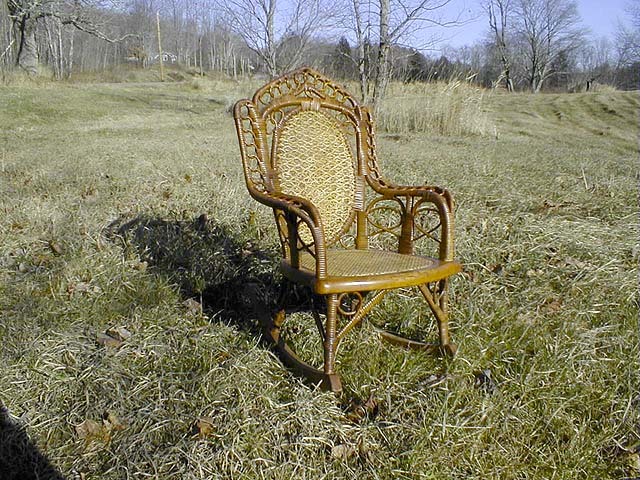 The slip seat on this reproduction was done in natural rush. 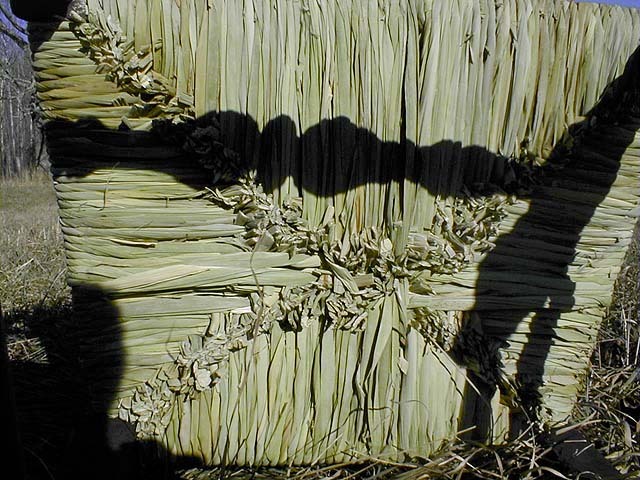 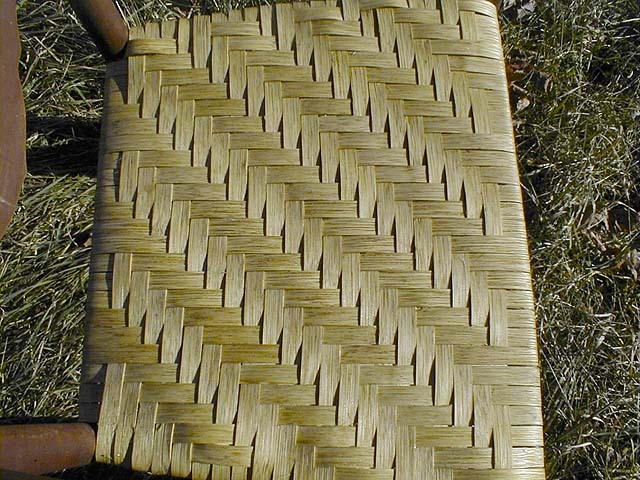 Note the traditional "X" pattern created by the weave. 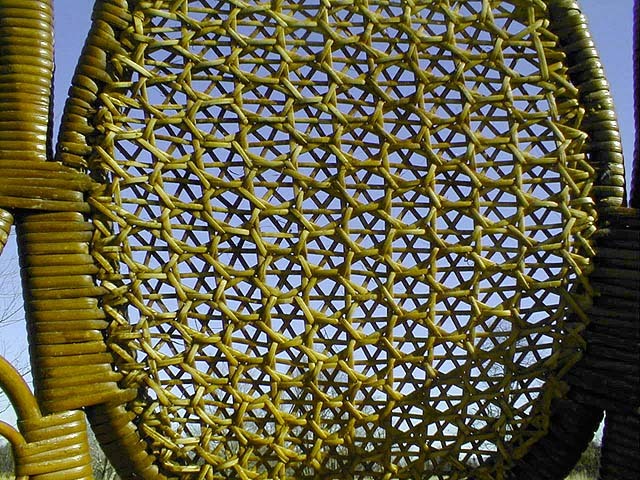 View of the under side of a natural rush chair seat. 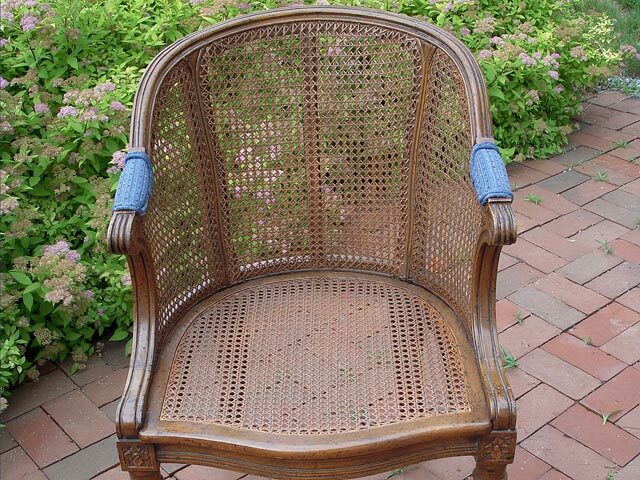 Hand-woven cane is the perfect choice for this round seat. 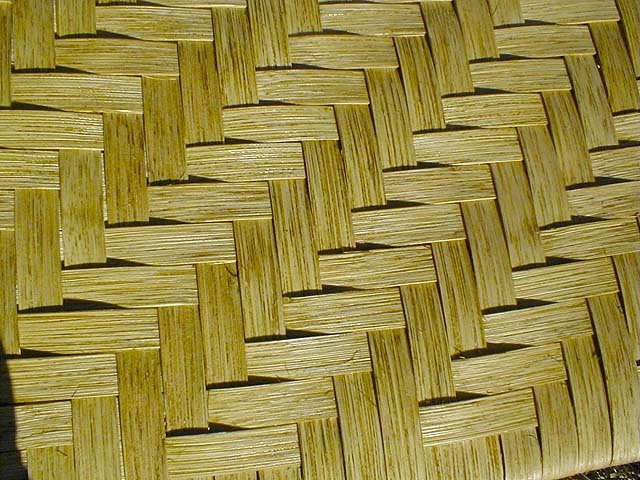 Close-up of hand-woven cane seat. 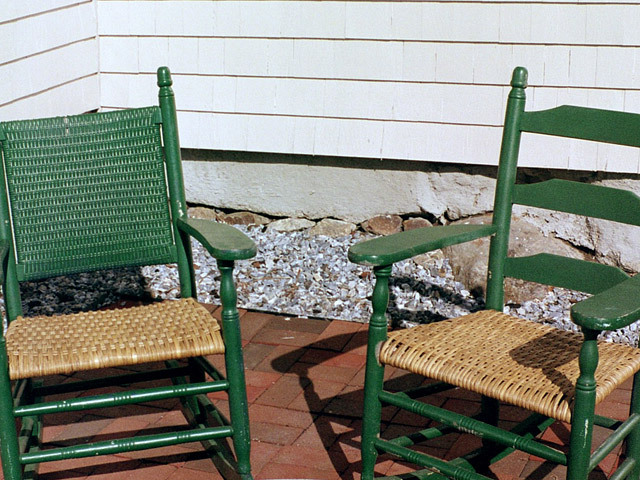 Shaker tape comes in a variety of colors and makes a nice, soft seat. 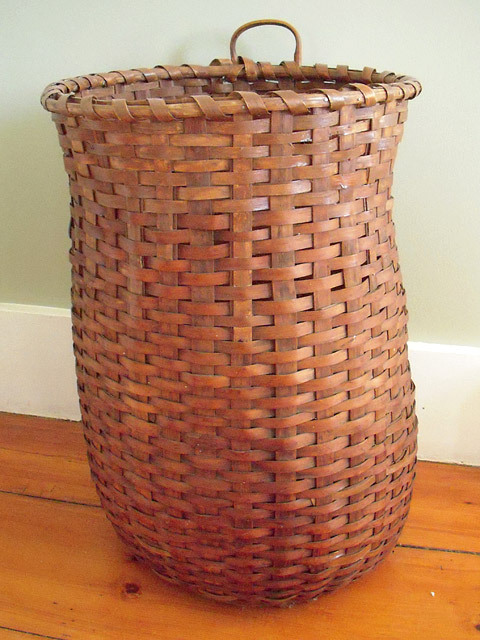 This vintage pack basket of brown ash was lovingly restored with our hand-harvested ash. 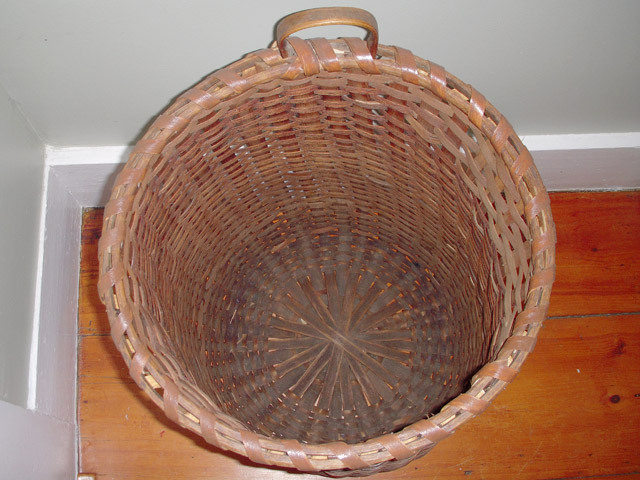 Inside of the pack basket. 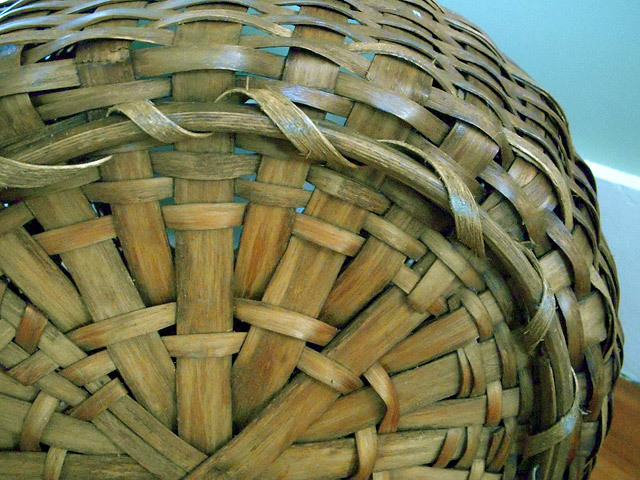 Bottom of pack basket, detail of hand-harvested ash. 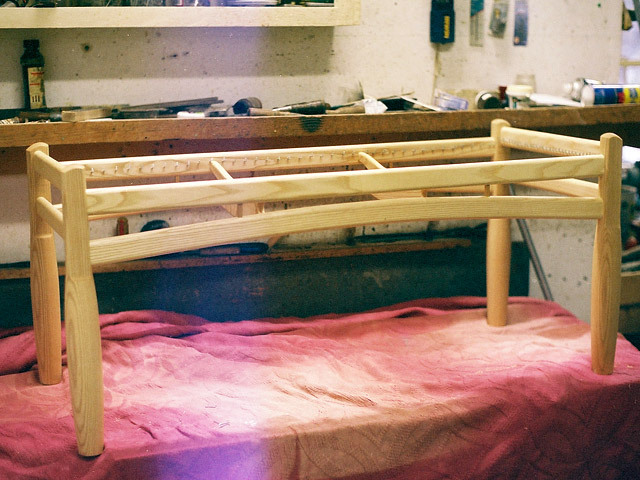 Peter Turner, a local craftsman, made the frame. 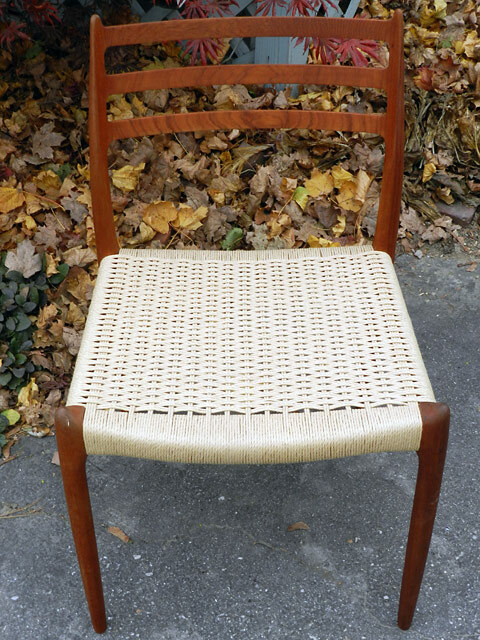 Danish cord was chosen to fit his style. 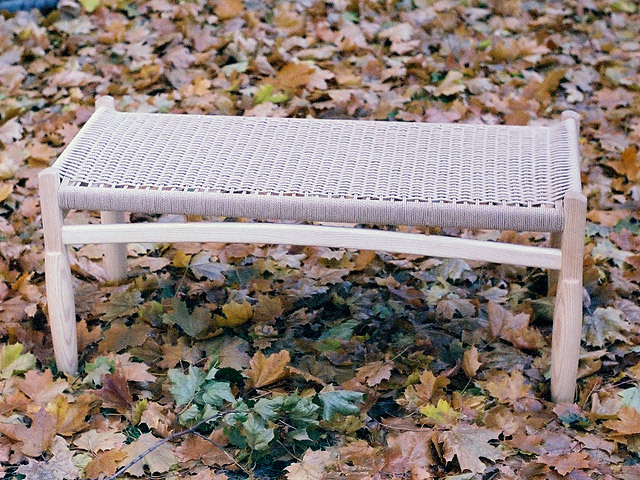 Another view of Danish cord bench. 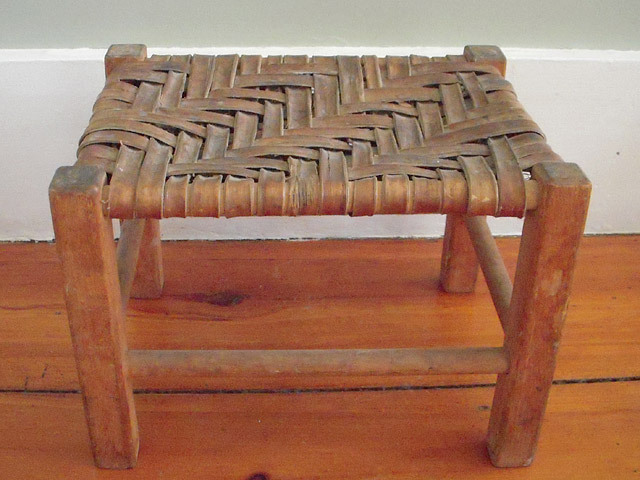 The rustic footstool pictured was done in hickory strips. 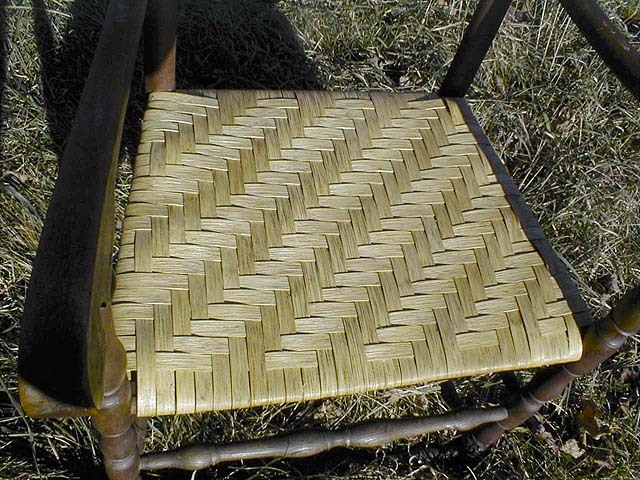 The herringbone pattern is on both sides. 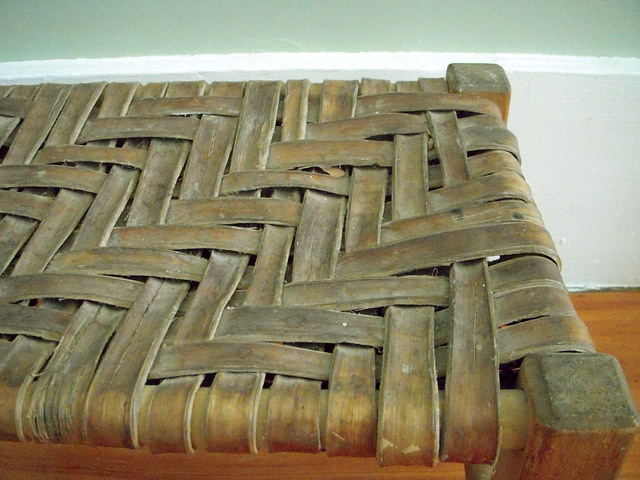 Underside of the rustic footstool. 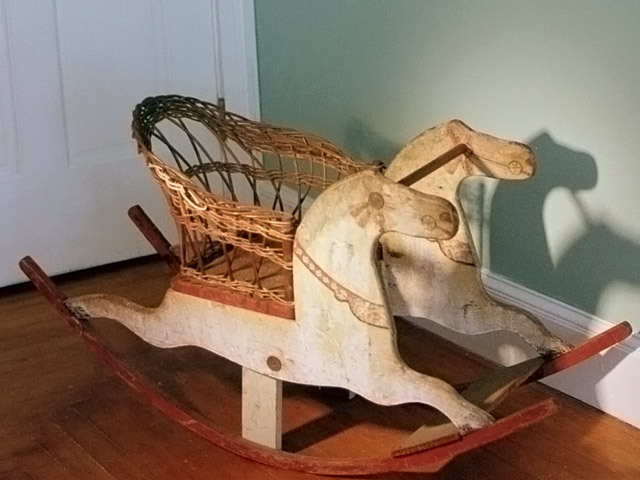 The wicker seat on this antique rocking horse will now last into the next generation. 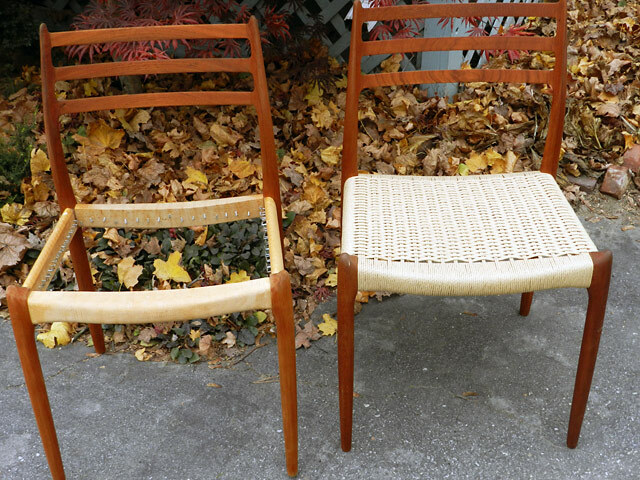 Traditional porch seats call for flat oval reed. 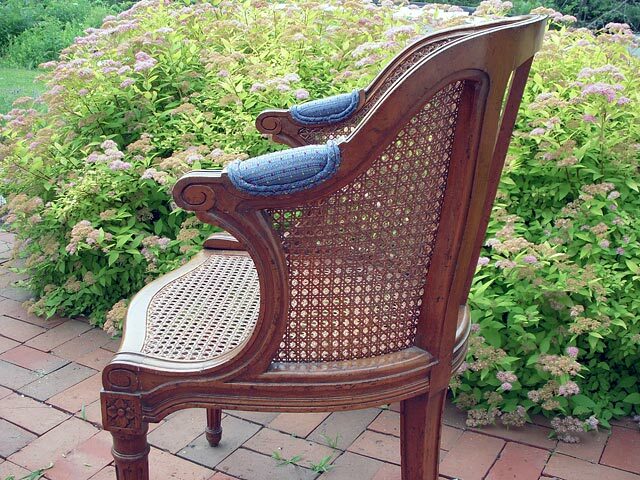 The curlicues were restored on this vintage rocker. 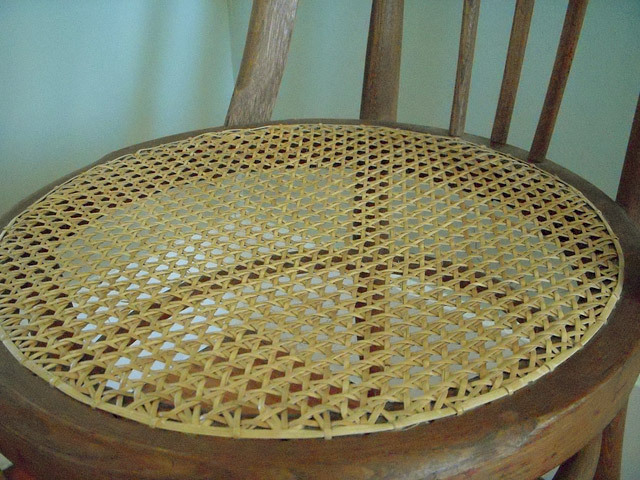 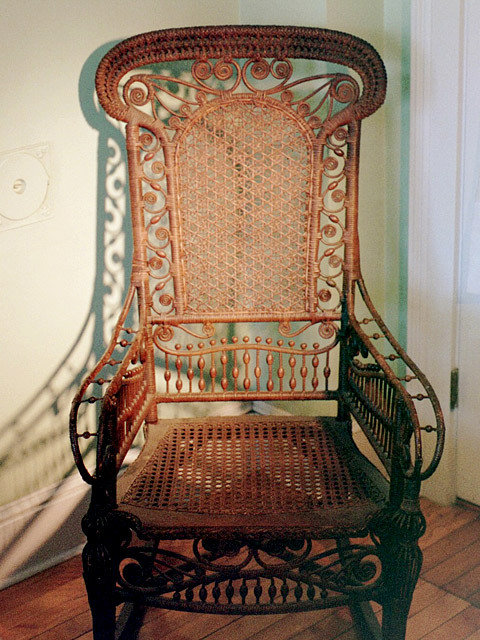 The back on this old rocker sports the popular spider web weave, done in hand-woven cane. 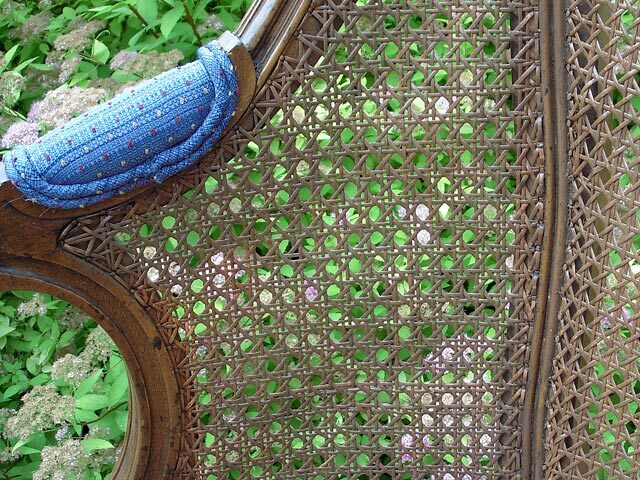 Close-up of spider web weave. 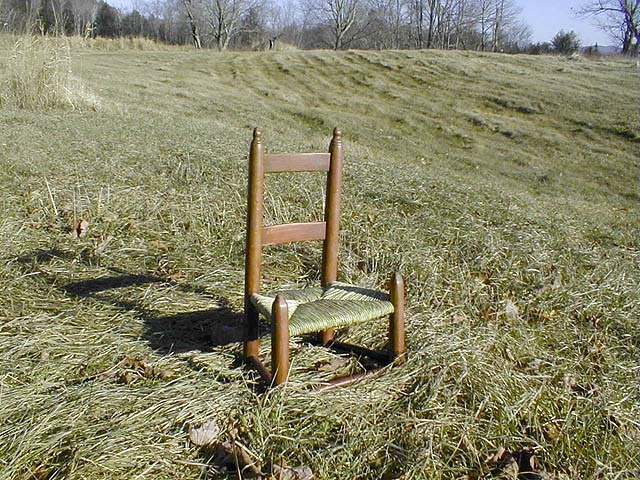 This antique child's chair called for natural rush seating. 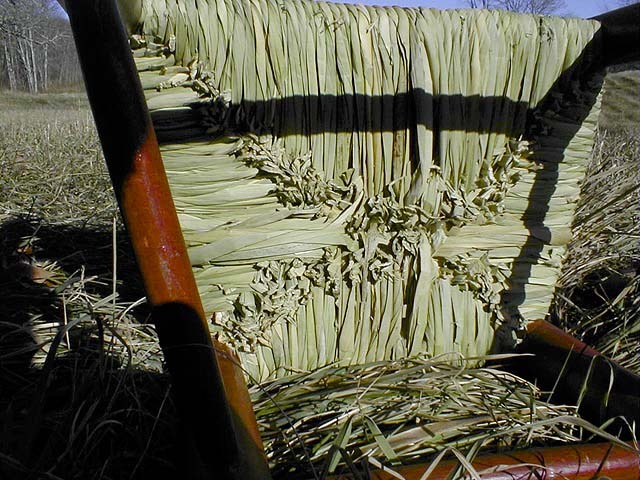 Close-up of top of natural rush seat. 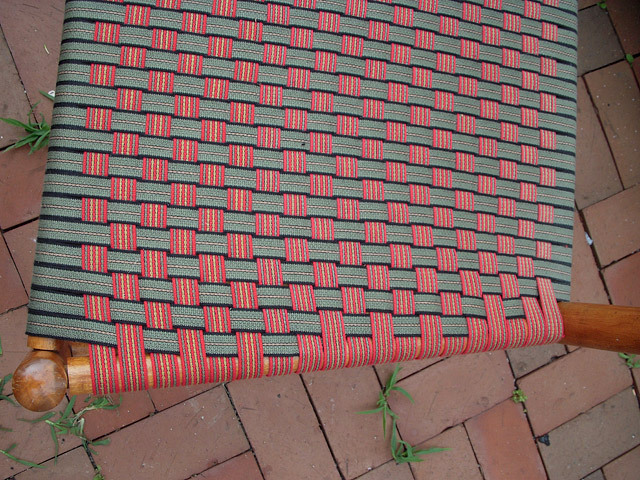 Close-up of underside of natural rush seat. 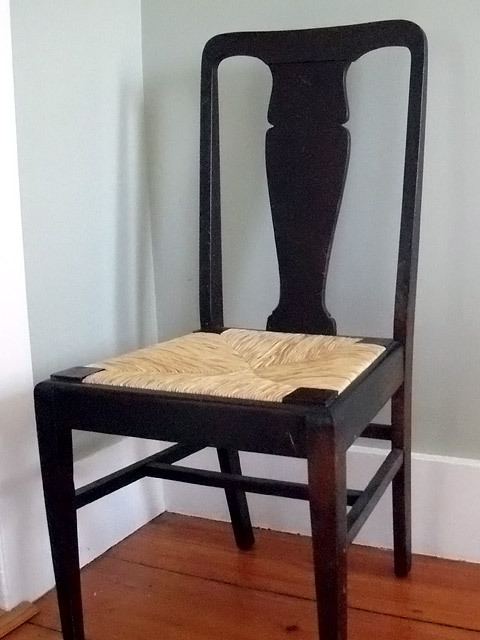 Natural rush was also chosen for this banister back chair made by yours truly. 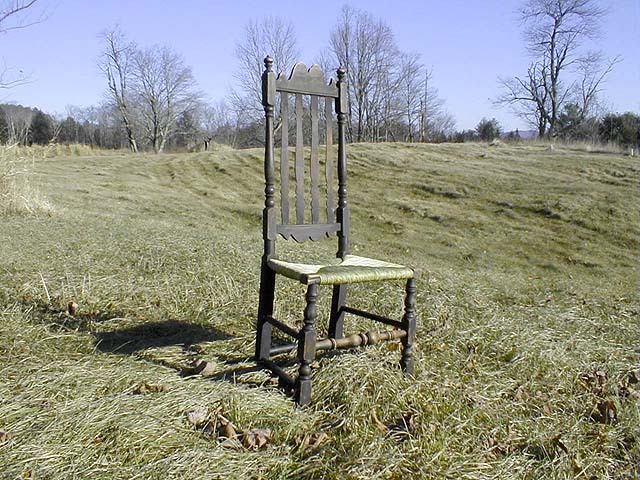 The choice of a flat reed seat for this fine antique chair was unusual but it works well. 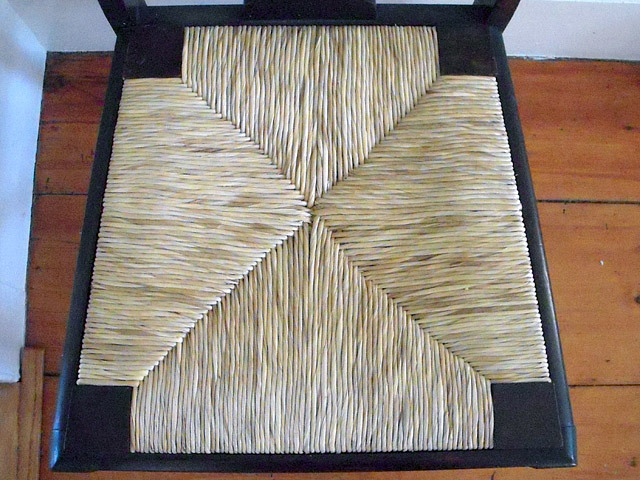 Another view of the flat reed seat. 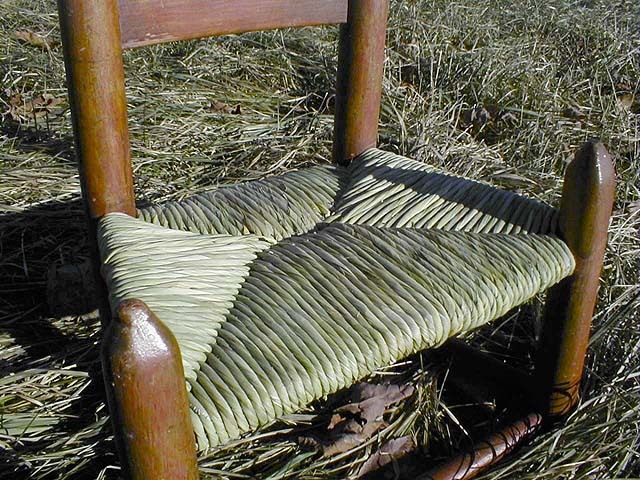 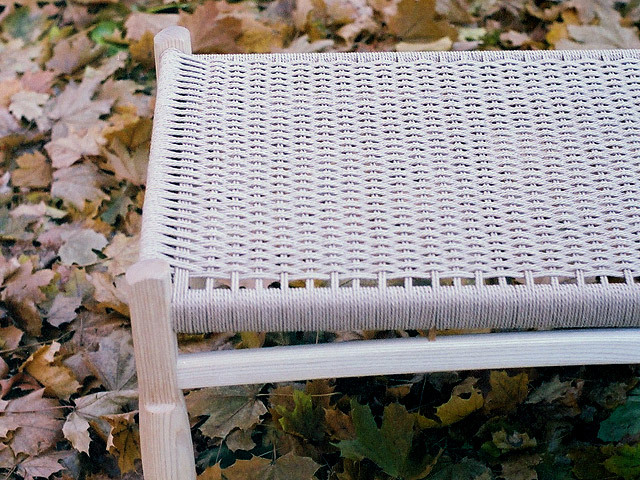 Close-up view of flat reed chair seat.